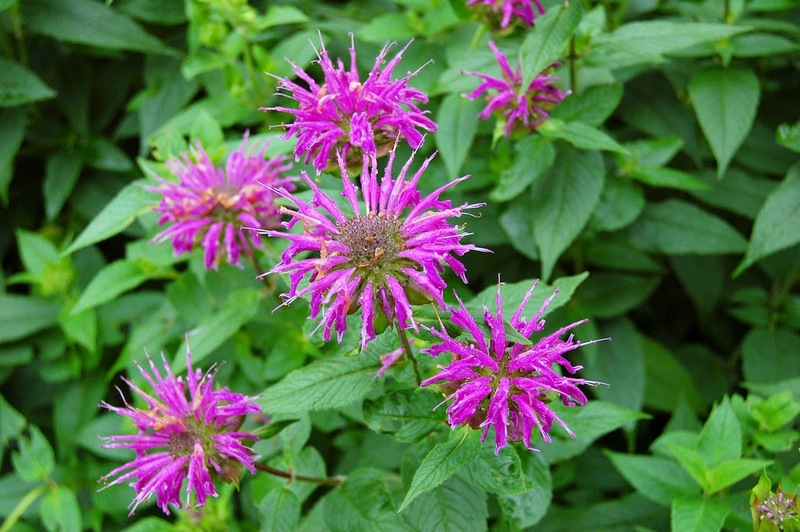 Bee Balm Herb (Wild Bergamot) is a perennial herb native to Eastern North America. Bee balm grows in dry thickets, clearings and woodland edges from Ontario and British Columbia to Georgia and Mexico. Bee Balm has showy, red, pink, or lilac flowers in large heads or whorls of about 20-50 flowers at the top of the branching stem, supported by leafy bracts, the leaflets are a pale-green color. The stem of Bee Balm is square, grooved and hard; and about 3 feet high. The leaves occur in opposite pairs, are rough on both surfaces, are distinctly toothed, and lance-shaped. Fine dense hairs cover much of the stem and leaves. Bee Balm roots are short, slender, creeping rhizomes. Bee Balm leaves and flowers and stems are used in alternative medicine as an antiseptic, carminative, diaphoretic, diuretic and stimulant. An infusion is medicinal used internally in the treatment of colds, catarrh, headaches, and gastric disorders, to reduce low fevers and soothe sore throat, to relieve flatulence, improving appetite, nausea, menstrual pain, and insomnia. Steam inhalation of the plant can be used for sore throats, and bronchial catarrh (inflammation of the mucus membrane, causing an increased flow of mucus). Externally, bee balm is a medicinal application for skin eruptions and infections. Bee balm also has a history of use as a remedy for muscle pain when consumed as a tea, or when used externally for soaks or other applications. Bee balm is a wonderful remedy for burns. It can be infused in honey, in vinegar as a tea wash or even as a spit poultice. Once the heat has left the burn it can be applied as a salve. A tea made from bee balm or a tincture of bee balm diluted in water not only freshens the breath but can also address infections in the mouth and gums. As a spicy carminative herb, bee balm can promote stagnant digestion and relieve discomforts such as bloating, cramping and excessive gas. Besides helping with a little indigestion, bee balm is a heavy hitter for serious intestinal woes from diarrhea to vomiting to cholera. However, members of the mint family also have a reputation for stimulating the liver and the gall bladder, and aggravating gastro-esophogeal reflux disease (GERD), so use with caution for anything other than mild stomach upset. Bee balm is strongly anti-fungal, lending itself to combatting topical infections as well as imbalanced healthy flora such as candida overgrowth and chronic vaginal yeast infections. Bee balm can also be used as an antiseptic and antibacterial by soaking a cloth in the tea and applying as a compress. 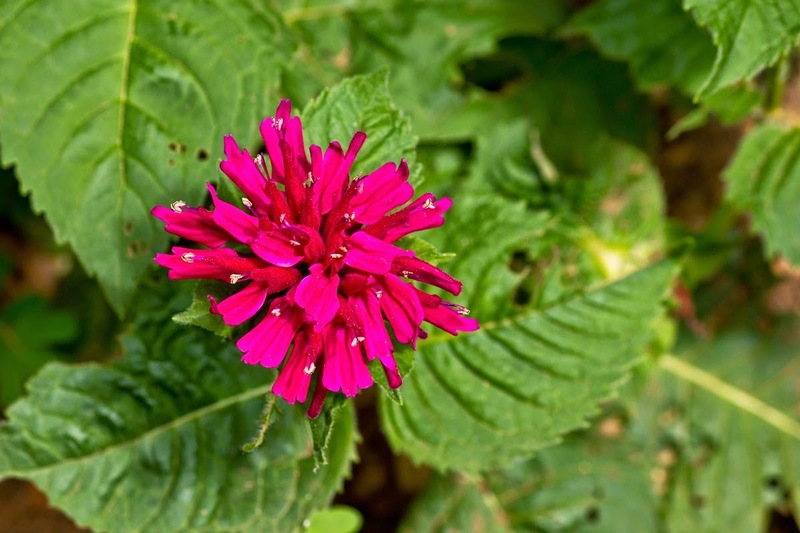 Bee balm can be made into an ointment for use as a pain reliever and to speed the healing of minor wounds, insect bites/stings, eczema, psoriasis, cold sores, and acne. One of the ways bee balm helps to break up stagnancy through its diffusive actions is by promoting delayed menses. We call this an emmenagogue or blood mover and bee balm should not be taken in large amounts by women in pregnancy. Confer with your physician before using any herbal remedies. Also be sure you procure herbal preparations from safe, reliable sources. Those who have thyroid issues should use caution when ingesting bee balm; also, those who are pregnant should not take it internally. While rubbing the leaves of bee balm can be a repellant for insects – especially mosquitoes – for some people, this may cause sensitivity to the sun, so don’t use undiluted without testing on a small area of the skin. As with any new treatment, check with your healthcare provider before using.